Forget what you’ve heard about “being one of the boys,” “having it all,” and “going for the jugular.” Here is how real women get ahead in the workplace. These six actions will help women to achieve and take advantage of the particular strengths they bring to the workplace. According to Catalyst’s 2018 study, women currently hold 25 (5.0 percent) of CEO positions at the S&P Fortune 500 companies. To find out how many women are at other levels of S&P 500 companies, take a look at the Catalyst, "Pyramid: Women in S&P 500 Companies" (June 1, 2018) pyramid. Catalyst finds that among top earners, women are at 11 percent. Women hold 21.2 percent of Board seats, 26.5 percent of executive or senior level management positions, and 36.9 percent of the first level to mid-level management positions. Is there a correlation? Absolutely. In the United States, women were nearly half (46.9 percent) of the labor force but held only slightly over a third (39.8 percent) of management roles in 2017. White women held almost a third of all management positions at 32.5 percent, followed by Latinas at 4.1 percent, Black women at 3.8 percent, and Asian women at just 2.4 percent. Women made up the highest share of managers in the human resources occupations (70.8 percent) and in social and community services (70.2 percent). The percentage of US businesses who employed at least one woman in senior management jumped from 69 percent in 2017 to 81 percent in 2018, but the percentage of senior roles held by women decreased from 23 percent to 21 percent. Half of women executives and sixty-eight percent of CEOs say that lack of significant line experience “holds women back” (Catalyst, "Women in U.S. Corporate Leadership," 2003). Learning about the financials doesn't happen overnight. When Margaret Morford, 50, of Brentwood, Tennessee, was Vice President of Human Resources for a large distribution company, she recalls, “I took the same finance for non-financial managers course three times until I got it." "I used that financial knowledge to demonstrate Human Resources’ impact to the bottom line. Once I started speaking in numbers, the senior managers in my peer group began to view Human Resources as a business partner rather than as an administrative drain on revenues." Want to retain top-talent women and understand what they want to obtain from their work? The most common reason women in this study gave for why they stay with their current employer "was that their job fits well with other areas of their life. The second most popular reason given was that they enjoy the work that they do, followed by believing that their job gives them the opportunity to make a difference. "Statistically, women were more likely to stay with their employer for these reasons over what might be considered more concrete, traditional reasons such as pay, benefits, or because of their manager. "These results reinforce findings from the American Psychological Association’s 2012 Workplace Retention study, which found that among over 1,000 Americans surveyed, job fit and enjoyable work are the two biggest reasons employees stay with their organizations." When women leaders were asked, they told stories like the one, Pam Judd, age 53, shared. Shortly after she began working for Levi’s, Pam was advised by her boss and peers that if she wanted to get ahead, she shouldn’t be so nice. The essential Pam is a very nice person–caring, empathetic, a person who remembers every event in her friends’ and family’s lives with a card, gift or phone call. Pam ignored that early advice and made the decision to be herself, stay true to her gut instincts and stayed the course. Now, 33 years later, she is a sales director, one of the top female leaders in her company, and she is also still nice. "Women want to work for organizations that help them find their calling. "Women want flexibility in where, when, and how they work. "Women want leadership opportunities—but they also want the resources and support required to make these opportunities successful." Almost fifty percent of women executives cite “developing a style with which male managers are comfortable” as critical to success (Catalyst, "Women in U.S. Corporate Leadership" 2003). And, highly successful women know not to flirt, swear, or be the last one at the bar. A 2005 study by Tulane University found that women who send flirtatious email, wear short skirts, cross their legs provocatively, or massage a man's shoulders at work win fewer pay raises and promotions. Employ outside services for domestic help. Share personal responsibilities with a partner. Rely on supportive relatives other than their partner. 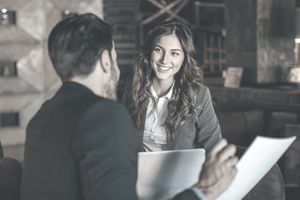 According to Nicki Joy and Susan Kane-Benson, authors of "Selling is a Woman’s Game," women tend to encourage harmony and agreement, consult with experts, employees and peers before making a decision, and make personal connections with others at work. As more organizations move away from authoritarian organizational values and a rigid hierarchy to a more open, informal, democratic model, “being raised as a man is no longer an advantage” says John Naisbitt, author of "Megatrends." Most HR practitioners and managers agree.